The minister told the crowd gathered at the Executive Hotel that his immigration crackdown — from marriage fraud to human smuggling and what he called the “abuse of Canada’s generosity” — is not driven by ideology or racism. “One thing that is unique about Canada is that this is the only developed democracy in the world in which there is no serious or organized anti-immigrant or xenophobic sentiment in our public discourse,” he told a crowd hosted by the Burnaby Board of Trade and the Immigrant Employment Council of BC. “I want to keep it that way. For one of the activists outside the speech, Kenney’s claims of no serious xenophobia in Canada were hard to stomach. Citing the case of refugee claimant Veronica Castro, who was beaten to death in Mexico this April five weeks after her deportation from Canada, Lee Williams said Kenney is hypocritical. “We’re talking about immigrants coming here, people of colour exploited for labour, being sent out of the country, denied status, who cannot have their spouses come over, who can’t have access to health care. I’m curious to know how that’s not xenophobic,” said Williams, a member of the migrant justice organization No One Is Illegal. Williams claimed she was inexplicably blocked from attending the event, despite having registered for the $35 reception on Wednesday. The Burnaby Board of Trade insisted it had no record of her registration, leading some activists to suggest attendees were being politically screened by Kenney’s office. Another activist was dragged out of the hotel lobby by her arms and legs after she was denied entry to the talk and refused to leave the building. The minister was in Burnaby to discuss his plan to revamp the overseas application process for immigrants, with a push towards evaluating professional and educational experience and encouraging those who have jobs lined up here already. One concern raised by No One Is Illegal — a group Kenney characterizes as “hard-line, anti-Canadian extremists” — is a new policy forcing spouses to remain married for two years after immigration to Canada. After facing criticism from women’s and immigrant groups who warned the rule could trap women in abusive relationships, Kenney added an exceptionwhereby immigration officials could evaluate claims of domestic abuse. 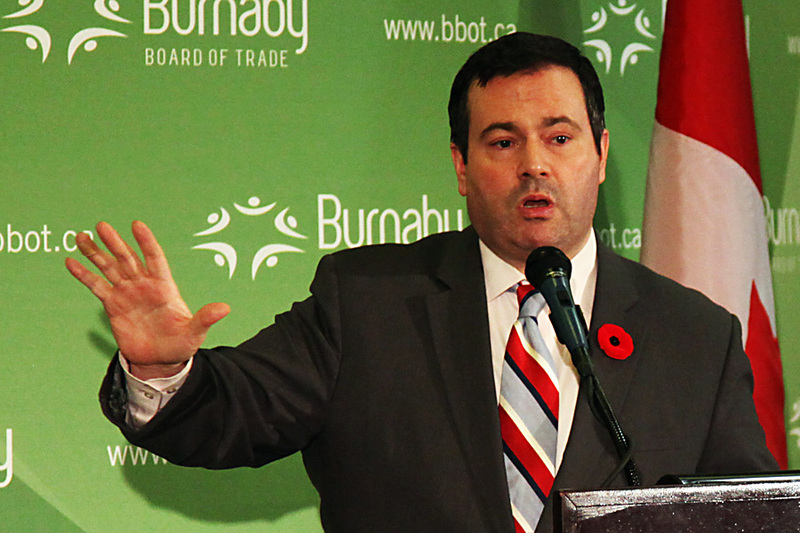 “We get a lot of fake marriages, which victimize some Canadians who get duped into sponsoring someone from abroad — then they get really hurt emotionally by the whole situation,” Kenney told The Tyee. “It’s created an industry of commercial marriages, where tens of thousands of dollars change hands in order to do a fake immigration marriage. But Williams said that even with the abuse clause, the marriage fraud policy is a threat to women’s safety, and many could be hesitant to come forward in case they risk deportation. “The question becomes: how do you prove the abuse that you’re in?” she said. “The burden is on the woman to provide this proof. Kenney said his reforms are simply common sense, and help protect Canada from being taken advantage of.